In order to provide the best services to all our patients and their families we request all parties adhere to the following policies. Please read carefully and ask questions if necessary. For after-hours emergencies call our office and listen carefully to the message for instructions. For your convenience we utilize an automated reminder system. However, it is not fool-proof. It is still the responsibility of the patient or parent to keep track of appointment dates and times. Appointment Times: There are two types of appointments. Our schedule allows for the maximum number of "after school" appointments possible. Some appointments must be held mid-day. 1. Construction appointments that require more doctor, set up and finishing time. These appointments begin at 9:00 a.m. and end at 2:30 p.m.
2. Maintenance appointments scheduled at 4-10 week intervals between 8-9 a.m. and 2–5 p.m.
Timeliness: We pride ourselves on running an on time appointment schedule for all our patients. You should not have to wait more than 15 minutes to be called for your appointment. Please notify the receptionist if you wait more than 15 minutes. If you are more than 15 minutes late, you may be required to reschedule your appointment. Missed Appointments. Missed appointments may possibly result in delayed treatment progress. Patients missing more than two appointments during the course of a year may be charged a fee of $80. As a courtesy to our patients we file insurance claims for FULL orthodontic treatment. There are exceptions to this.Please read this section for a complete understanding of insurance filing procedures. Filing for Treatment. Insurance must be active at the time treatment begins. The term "Treatment" refers to either Interceptive or Comprehensive Orthodontics. Changes in Insurance. Please inform us immediately of changes in insurance.We are unable to file claims if you obtain insurance after treatment has begun or if your insurance policy changes during the course of treatment.Our office staff, as a courtesy, can assist you with filing those claims yourself. All patients entering treatment must have a Truth-in-Lending signed by a financially responsible party. Payments received after the 16th of the month will be charged a $25 late fee. There is a $25 charge for returned checks and or electronic transactions, including declined credit cards. You may request that we not use or disclose your health information for a particular reason related to treatment, payment, our general healthcare operations, and/or to a particular family member, other relatives or close personal friend. We ask that such requests be made in writing on a form provided by us. Although we will consider your request, please be aware that we are under no obligation to accept it or to abide by it, except as provided below. If you have paid for services out-of-pocket in full, you may request that we not disclose information related solely to those services to your health plan. We ask that such requests be made in writing on a form provided by us. We are required to abide by such a request, except where we are required by law to make a disclosure. We are not required to inform other providers of such a request, so you should notify any other providers regarding such a request. You have the right to receive confidential communications from us by alternative means or at an alternative location. Such a request must be made in writing, and submitted to the Privacy Officer. We will attempt to accommodate all reasonable requests. You may request to inspect and/or obtain copies of health information about you, which will be provided to you in the time frames established by law. If we maintain your health information electronically in a designated record set, you may obtain an electronic copy of the information. If you request a copy (paper or electronic), we will charge you a reasonable, cost-based fee. If you believe that any health information in your record is incorrect, or if you believe that important information is missing, you may request that we correct the existing information or add the missing information. Such requests must be made in writing, and must provide a reason to support the amendment. We ask that you use the form provided by us to make such requests. For a request form, please contact the Privacy Officer. You may request that we provide you with a written accounting of all disclosures made by us during the time period for which you request (not to exceed six years), as required by law. We ask that such requests be made in writing on a form provided by us. Please note that accounting does not include all disclosures, e.g., disclosures to carry out treatment, payment, or healthcare operations and disclosures made to you or your legal representative or pursuant to an authorization. You will not be charged for your first accounting request in any 12-month period. However, for any requests that you make thereafter, you will be charged a reasonable, cost-based fee. You have the right to be notified following a breach of your unsecured protected health information. You have the right to obtain a paper copy of our Notice of Privacy Practices upon request. You have the right to complain to us and to the Secretary of the U.S. Department of Health and Human Services (HHS) if you believe we have violated your privacy rights. We will not retaliate against you for filing a complaint. Beth Wharton (540) 347-1888 ext. 11; 179 Broadview Avenue Warrenton, VA 20186; beth@geortho.com. To file a complaint with the Secretary of HHS, send your complaint to: Office for Civil Rights, U.S. Department of Health and Human Services, 200 Independence Avenue, S.W., Room 509F HHH Bldg., Washington, D.C. 20201. If you have any questions or want more information about this Notice of Privacy Practices, please contact our Privacy Officer. The following information is routinely provided to anyone considering orthodontic treatment in our office. While recognizing the benefits of a pleasing smile and healthy teeth, you should also be aware that orthodontic treatment, just as any treatment of the body, has inherent risks and limitations. These potential complications are seldom sufficient to rule out treatment but should be considered when deciding whether to proceed. Please note that it is impossible to list every possible circumstance, but the following represents our best estimate of the information you need. DECALCIFICATION (Permanent Scarring of the Teeth), DECAY (Cavities) OR GUM DISEASE – These problems may occur if the patient does not cooperate with proper brushing and flossing. Additionally, maintaining proper dietary control is essential, especially in minimizing the intake of sugar. Routine visits to your dentist (every 3-6 months) for cleaning and cavity checks are essential. TREATMENT TIME AND RESULTS – Our estimated treatment time is our best guess as to how long treatment will take. Progress can be delayed by abnormal facial growth, tooth moving mechanical difficulties, poor appliance and elastic wear, lack of cooperation, broken appliances and missed appointments. Lack of cooperation can also lead to treatment results that are less than ideal. Due to the wide variation in the size and shape of the teeth, missing teeth, etc., achievement of ideal results (for example, closure of space) may not be possible. Restorative dental treatment or occlusal adjustment (a grinding method to fine-tune the bite) may be necessary. ABNORMAL GROWTH – Abnormal growth can upset the most carefully planned treatment. A patient who has grown normally may not continue to do so. If growth becomes disproportionate, the jaw relationships may be seriously affected and original treatment objectives may not be met. DISCOMFORT – It is normal for your teeth to get sore during orthodontic movement. This usually lasts for a few days after an adjustment. Speak with your orthodontist about ways to manage the discomfort. ROOT RESORPTION – In a few cases, the ends of some of the teeth are shortened during treatment. In the event of subsequent gum disease or a severe situation of resorption, this shortening could reduce the longevity of affected teeth. Under healthy circumstances, the shortened teeth usually suffer no disadvantage. If resorption is detected during treatment, your orthodontist may recommend a pause or discontinuation of treatment. NONVITAL OR DEAD TOOTH – A tooth traumatized by an accident or deep decay can die over a long period of time with or without orthodontic treatment. This tooth may discolor or flare up during treatment and require endodontic therapy (root canal). IMPACTED, ANKYLOSED, AND UNERUPTED TEETH – Teeth may become impacted (trapped below the bone or gums), ankylosed (fused to the bone), or just fail to erupt. These teeth can harm adjacent teeth and bone with or without orthodontic movement. These conditions often appear for no apparent reason and cannot be anticipated. Treatment may require extraction, surgical exposure, or prosthetic replacement of the offending teeth. GENERAL HEALTH PROBLEMS – Bone, blood, or endocrine disorders, and many prescription and non-prescription drugs (including bisphosphonates) can affect your orthodontic treatment. Allergic reactions to certain components of orthodontic appliances may require a change in the treatment plan or discontinuation of treatment. It is imperative that you inform your orthodontist of an allergic reaction or any changes in your general health status. TMJ PROBLEMS – Some patients may develop jaw joint noises, discomfort and facial pain related to the jaw before, during, or after treatment. The current belief is that these problems are caused more by habitual grinding of the teeth (often related to stress) rather than the way in which the teeth bite. If such a problem arises, treatment by another specialist may be required. Orthodontic treatment is not intended to correct pre-existing TMJ problems. EXTRACTIONS AND ORTHOGNATHIC (JAW) SURGERY – In some instances, extraction of permanent teeth (usually due to severe crowding, dental protrusion, or a hopeless tooth) and/or jaw surgery (due to severe abnormalities in the position or size of the jaws) might be necessary along with orthodontic treatment. If either are included as part of your orthodontic treatment plan, discuss the additional risks associated with these procedures with the dentist or surgeon. INJURY FROM APPLIANCES – Some orthodontic appliances can be injurious. Careful adherence to instructions regarding each appliance prescribed will minimize any potential problems. Loosened or damaged appliances can be inhaled, swallowed, or could cause other damage. Inform the orthodontist immediately of any unusual symptoms or if anything feels loose or broken. TOOTH RESHAPING – Due to the variability in the sizes and shapes of teeth and in situations of excessive crowding, in certain individuals, some teeth are selectively reshaped. This process involves the removal of a small amount of enamel between the teeth, from the biting surfaces, and from rough edges and areas of uneven wear. This process is usually painless and is intended to produce a more balanced, healthy bite and esthetic smile. RETURN OF ORIGINAL PROBLEM – Teeth have the natural tendency to return to their original position after orthodontic treatment. Throughout life, the bite and alignment of teeth can change adversely for various reasons not limited to: the eruption of wisdom teeth, growth and/or maturational changes, mouth breathing, pathological processes, and oral habits. Careful cooperation during the retention phase of treatment will keep this relapse to a minimum. ADDITIONAL TREATMENT – Treatment by another dentist or specialist might be required before, during or after orthodontic treatment; and associated fees are not included in the orthodontic treatment fee. Additionally, unforeseen circumstances such as abnormal growth or gum disease may cause us to recommend a form of additional treatment not previously discussed. If this occurs, we will carefully explain the reasons for a change in the treatment plan and any extra fees before proceeding. If additional treatment is required after the removal of the braces, additional fees will be assessed. By signing below I acknowledge that I have read and understand the above and have had an opportunity to discuss this information with the Doctor. All questions have been answered to my satisfaction. 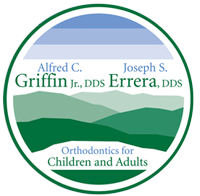 I authorize Dr. Griffin, Dr. Errera, and staff to perform the necessary treatment.